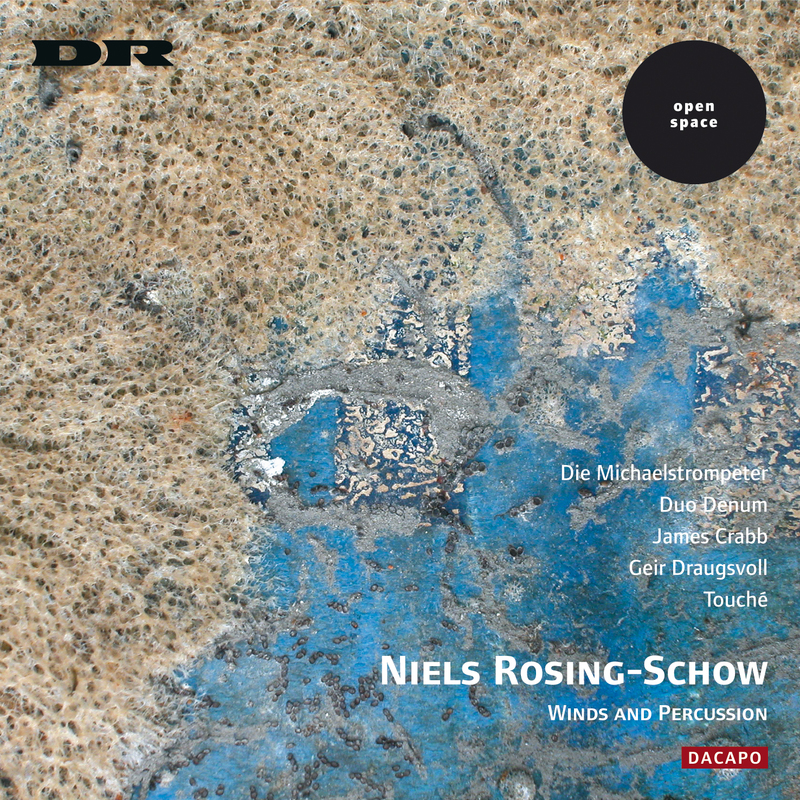 The music of the Danish composer Niels Rosing-Schow (b. 1954) seeks to explore the different ways in which music of a distinctly modernist and individual cast can reconquer the large musical spaces without resorting to ready-made solutions. Exploring the forces of growth, transformation, and decay, it suggests a state of nature in constant flux. Rosing-Schow's works are marked by a subtle sense of orchestration, producing fascinating sonorities and beguiling instrumental colourings. Piseq - Ritus III (1996) 14:22 12,80 kr. Spiral Ladder II (1998) 7:47 9,60 kr. Ritus II (1990) 13:19 12,80 kr. Although this cd features four works with four different ensembles written over a period of eight years, we sense an interrelationship among the works - as if they are speaking to one another, complementing one another across differences in their dates of composition as well as in their instrumentation. In fact the instrumental resources can be reduced to just two kinds of sound source: percussive and wind-based (saxophone, accordion and trumpet), with the ‘wind production' coming from bellows (accordion duo) and the human chest (saxophone, trumpet). The nature of the ensemble alone allows us to trace links from work to work. But even more important are the features shared by the musical material. The feeling of an underlying spirituality runs through the works: not a subjective mysticism, but a spirituality that accommodates something bigger than the subject, something suprapersonal in the music which, in different guises, observes its own inexorable logic - through organic processes that audibly take the music through transformations (even extreme ones), through religious-sounding monophonic Gregorian melody, or through musical stagings of ethnic-sounding ceremonies and rituals. Greenlandic tradition the word means personal owner-ship of a drum song. The work expresses the mood of ancient invocations of gods and magical conjurations more than it unfolds a particular course of events. The creation of a magical sound universe, as in his Piseq (Ritus III), is an example of the special elevated mood of Rosing-Schow's music. Something is happening that goes beyond the given and evokes archetypal images - but also processes of transformation, for the sounds are not without time and direction. Transformation as an intangible forward motion is sensed constantly behind the music: the sounds thin out to individual notes in harmonics and brushed vibraphone, and with a descending motion the music ‘purls' with a velvety-soft sound into the concluding Greenlandic melody. The suprapersonal in the music is however not solely related to ritual and the divine. What we encounter in the second work on the cd, Spiral Ladder II for accordion duo (1997/98), is process as an image of growth in nature. The expression of Spiral Ladder II in a peculiar way both contrasts with Piseq's mysticism and atmosphere of ethnic ceremonies, and - by virtue of its introductory pulsation - continues where Piseq leaves off. But a displacement takes place that sets a development in motion. Musically, we experience something like a ‘biological' process unfolding. However, Rosing-Schow's processes can also be enjoyed for their purely sonorous development, like a game that is played out according to precisely fixed rules, and which results in clearly followable, intuitively comprehensible music. The third work of the cd, Ritus II, takes up the ceremony of the ‘ritus' works again. We are once more in the midst of music full of mystery and magic - this time of the jungle, not of the cold north. Although large parts of the work make use of percussion instruments with fixed pitches (vibraphone and marimba), the overall experience is quite non-melodic. One mainly hears a play of rhythms as a result of the rhythmic patterns repeated in ever-changing variations and the deliberately non-melodic contours of the notes selected. threefold divisions: beginning - middle - end; birth - life - death; intonation - passage - hymn. These cue-words from the composer gather together spiritual elements, the suprapersonal as divinity and as force of nature, in a single image: the wind as the movement of air. The passage of the breath is manifested as sound as a reference to the invisible power known from the story of the Creation as the breath of God, the precondition of life. In the ‘ritus' works the ceremonial character of the music was linked with ethnic soundscapes which can further be associated with idea of the primal and of cultures where the gap between culture and nature is narrow. The primal and the natural are already closely related. With the above-mentioned associations in Windgeboren we have moved into the Christian sphere. But Rosing-Schow treats the Christian reference in the same way as the ethnic ones. By using Gregorian melody as a musical reference - on the one hand as a concluding hymn, on the other as the building-blocks of the introduction - he maintains the suprapersonal tone that has coloured all the works on the cd.